Paris Pavilion 525 x 385 Valence Pavilion 11'5"
Ideal for a corner location in your garden. 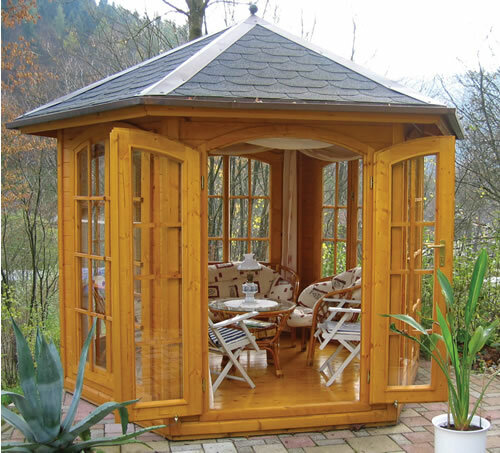 This Pau hexagonal summerhouse measure 3m (9'8") in diameter but of course any size is possible within this range. This building features full length glazing on every face for an extremely bright and airy summerhouse. Manufactured from Nordic timber from the coldest parts to ensure a tight, dense grain. Superior in it's design to many others on the market offering quality, thoughtful design that can be expected from a German precision manufacturer. The individual boards have been secured with a surrounding frame which reduces the woods natural movement, a common down side to the stacking construction used by other European manufacturers, each board is T&G and features a conical profile that allows the logs to actually click into place creating greater stability and resistance to movement over time so often found with inferior buildings . The panelled walls, roof and floor make this Pavilion straightforward and easy to install. The first class doors and windows are also made from Nordic pine and are laminated so you can be sure that they will be resistant to warping and bending that can occur with inferior buildings. These units are glazed with real glass and bedded in with silicone seals rather than the usual rubber used. Supplied with good quality roofing felt with felt tiles as an option. Simple installation with the panelled roof, floor and wall elements. This building is supplied without treatment, however for a small extra cost this can be done for you. You can order your pavilion painted in a choice of finishes and glazes. 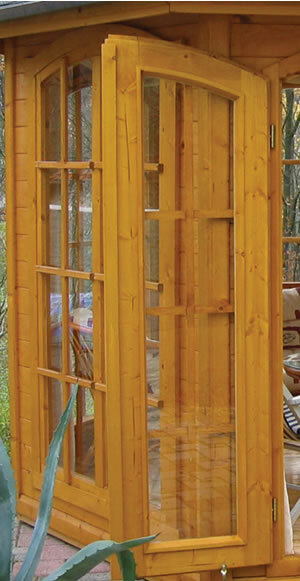 This process will give you a fully factory treated summerhouse which you can enjoy straight away, without a paint brush! The complete exterior of the summerhouse will be vanished in your own colour choice. You may even like to choose two colours to create contrasting doors, windows, walls and roof projection. The building is supplied with a standard green mineral felt, as an option it can be supplied with felt roofing tiles, these are of a superior quality to any others supplied from manufactures, these are sourced in Europe and have a fully lined backing so the entire tile is stuck to the surface resulting in a trouble free and durable finish to last for years. Choose from red, green or black rectangle tiles or red coloured rounded shingles. Because the German manufacturer builds each on building on order each building can be customised, starting from the wood selection, continuing with the profiling and milling of the wood, up to the making of windows, doors and accessories, it is possible to build a bespoke building for you, taking your personal requirements into account. We can manufacture to any specification from 12mm cladding up to a thickness of 190mm, please contact us to discuss your requirements. A Traditional Heavy Duty Pent Shed 3.66x2.44m a large and strong storage shed, with many options available. 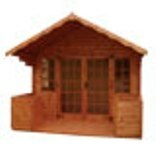 The Wentworth is a traditional heavy duty summerhouse with a large verandah. The Appleby Walkway Pergola from Grange, a classic structure designed to frame a garden path. A classic focal point for any garden. Pressure treated for longevity. An attractive summerhouse in the Georgian style, the Traditional Burford 10'x10' (3.00x3.00m) is enhanced by a front bay window.